I was the Lunar Module Pilot of Apollo 12 and the fourth man to set foot on the moon. I explored the beautifully desolate landscape of the Ocean of Storms and later, as commander of Skylab 3 (Skylab Mission II), I spent 59 days in orbit around our fragile, blue-and-white Earth. 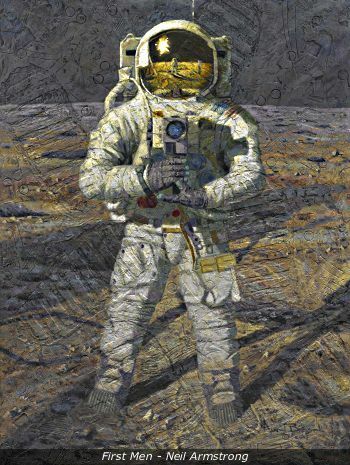 I had been painting earthbound subjects for many years by the time I returned from Apollo 12 and Skylab 3 missions, but my fellow astronauts convinced me to paint my experiences on the moon. Because of this unprecedented opportunity and challenge, I resigned from NASA in 1981 to devote all of my time and energy to painting, celebrating the great exploration that was Apollo. Over the years, my art has evolved into a mixture of painting and sculpture, textured with my lunar tools, sprinkled with bits of our Apollo 12 spacecraft and a touch of moondust from the Ocean of Storms. You can see many of my paintings on this site and read more about the space-age techniques and materials I use in my work.